2/8th Bn, The Worcestershire Regiment, 183rd Brigade, 61st Division, B.E.F. 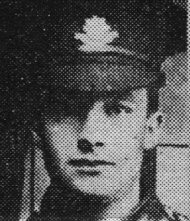 Pte Ralph Pritchard, Worcestershire Regiment (the youngest son of Mrs H Pritchard, Barber’s Hill, Malvern) who was reported missing in March 1918 was officially reported killed in action or died of wounds in September. Evidently his death occurred whilst a prisoner in German hands as a letter received from the Enquiries Department for Wounded and Missing Soldiers in connection with the Red Cross states that his name appeared on a German official list of the dead, however his body was never recovered or his grave lost. He joined up in November 1915 and was billeted for sometime in Malvern Link. He went to France in May 1916. He was aged 24 and was formerly employed in the gardens of the Priory School. He was an old member of the Church Lads Brigade and was a prominently associated with St Andrew’s Gymnasium.